1993 the 3DO company launched its 3DO Interactive Multiplayer, also known as 3DO. This powerhouse was one of the first home consoles that could manage real 3D games. It also came equipped with a CD drive and could manage photo CD and full motion video. The company's official stance was that the 3DO was not a video game console, but a high-end audio-visual system and was priced $699.95 USD at launch which was far above competing game systems. I bought mine in Sweden for 7000Kr. 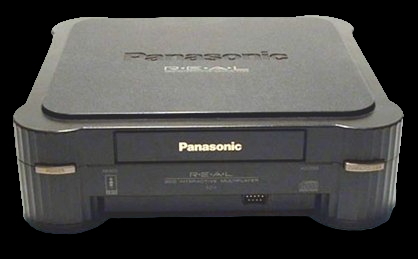 The 3DO system was eventually discontinued at the end of 1996 due to the limited library of titles, lack of third-party support and high price. Even though the 3DO did not last very long it managed to bring a large amount of really bad games. James Rolfe, also known as "the angry video game nerd" reviewed the game Plumbers don't wear ties and has said numerous times that it probably is the worst game he's ever played. The 3DO had a large amount of very low quality titles but it also had a few totally awesome titles. The first "Need for Speed" was created for the 3DO and was one of the best driving games ever when it came out with it's astounding 3D visuals and great simulation game play. I personally hold it to be the absolute best racing game of it's time. Wing Commander III was a perfect game for this fantastic console as it had a CD drive and could show full motion video. The game truly utilized this technology in a great way by making the video scenes interactive even though they were used as a way of pushing forward the superb story between the awesome 3D space flight simulated war battles. The actors of the full motion video footage were no other than famous big budged Hollywood movie stars such as Mark Hamill1, Thomas F. Wilson2, John Rhys-Davies3, Malcolm McDowell4 and many more. 1. Mark played the main protagonist Colonel Christopher "Maverick" Blair. Famous for his role as Luke Skywalker from Star Wars. 2. Famous as the bad guy "Biff H. Tannen" from the "Back to the future" Triology. 3. Played the Dwarf "Gimli" in "Lord of the Rings" triologi and "Sallah" from the Indiana Jones movies. 4. Known for his role in the controversial "A Clockwork Orange".